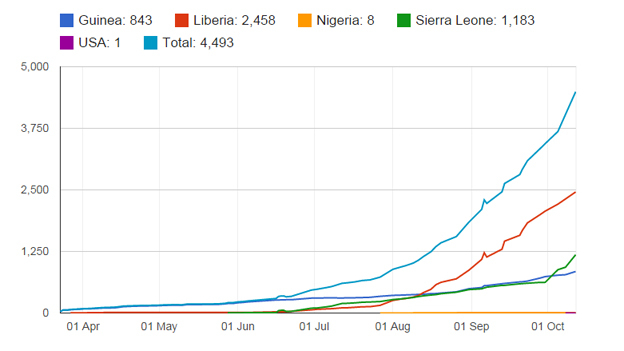 The basic problem is in the graph of the growth of Ebola over time. They have it by country, and in total. THE major issue is a simple one. All the curves continue to be upward sloping. The exponential continues. Until one of them (preferably the total as well) rolls over to flatten and then downward, we have a completely out of control and expanding plague. Quarantine is NOT a ‘dirty word’. It is a crude but effective tool to stop planting new weed patches and new sources of trouble in areas that are healthy refuges. Places from which a response can be raised. First, wall off the ‘bad thing’ (be it a virus, chemical contamination, nuclear contamination, whatever), then from your secure and clean base, provide a load of corrective / curative effort into the (now limited) area of involvement. Continuing to haul thousands of folks all over the planet from infected areas is insanity. Yes, IMHO, that includes Dallas now too. 1) The counts are likely to be low. Perhaps as much as 50% low. 2) That sudden turn up at the end for Sierra Leone was due to a review of hospital records. That curve is what we are ‘up against’. It will get a lot worse before it gets better. In earlier postings I’d pointed to some positive news. A CNN report on a retro-viral that looked to be curative. Other folks posted links that also pointed to potential “good things”. One was to an article on using massive intravenous Vitamin C (as the sodium salt) that had very good antiviral impact. Another was about Selenium, and that showed a very interesting thing. The symptoms of severe selenium deficiency include things, like hemorrhage, that are signatures of Ebola. And… The Ebola genome codes for sequences that would use a lot of the host selenium. The virus may be sucking up your selenium as a way of making you weak / sick. Large doses of Selenium would prevent that sequence. There was also some evidence for using nano particle silver as a virus killer. There was also a link to a Chinese drug with promise. 1) Land a mobile CBW hospital with complete hazmat gear in Africa. Use THAT as the place to treat, and quarantine, any health care workers and missionaries and such that get Ebola while working there. Do not take them off the continent until 30 days after recovery from infection, or 30 days after last exposure to infection in others. 2) Put the quarantine outer border outside the known exposed areas. (At present, cases are known from outside the presently closed boarders. See the map in the article at BBC.) Folks can go in, but nobody comes out. Set up a 30 day quarantine facility at the border. Folks can enter it from the sick area, and if healthy 30 days later, can exit to the healthy side. IF that facility has a case of Ebola, everybody has a reset on their quarantine time. Yes, it’s a ‘lock box’ for limiting who gets out and that they have proven to not have the disease (i.e. incubation has passed). 3) Start trials of each proposed treatment. There are plenty of desperate patients who would benefit from anything, even just a bit of hope. Also try combinations. (So selenium with anti-virals for example). As soon as something is shown to work, use it in a whole country (if enough drug is available). As soon as something is shown to work really really well, use it everywhere. Until those growth curves flatten, we are demonstrably clueless and doing the wrong things. Now, with one case in Dallas leading to 2 nurses sick, and with a couple of weeks left in the incubation period for the other healthcare workers, and with unknown 100s of folks exposed to the nurses; the USA is also on that exponential growth curve. Yes, we are down at the toe of it, but on it we are. It will be 20 days before we know how far on it we go. That’s about November 6 or so. We can make no statement at all about how many Ebola cases are in the USA until then. Only if we get no more at all can we then say how many there are… Until that time, we must assume we are on that exponential curve and act accordingly. We know the ‘protective measures’ didn’t work for those nurses. We know that exposures have happened. We know that cases have doubled. We know that we don’t know how to stop it. Yet. So the right thing to do is to act as aggressively as possible. Assume the worst and assume you do not know how to prevent spread nor treat the disease. So far that looks to be accurate. This entry was posted in News Related, Science Bits. Bookmark the permalink. On the good news, Nigeria and Ghana have declared themselves free of Ebola. Their containment and public health announcements look to have worked. Otherwise, EM, your suggestions seem eminently reasonable. We’ll see if any are actually implemented. The UK health worker who was cured has gone back to help again, figuring he’s now immune to it. Brave guy…. Quarantine has always worked in the past and is the only known way to stop the spread when a Vaccine is not available. All contaminated product should be burnt, so portable incinerators should also be essential. not 30 days from infection, 30 days from last exposure to the infected? There a stories out today that quote nurses from that Dallas hospital. And they say there were NO protective measures at all for the first two days. The hospital was completely unprepared. This points to the need to send any new patients to one of the specialized hospitals in the country for treatment. There are supposedly 4 of these hospitals. I assume Emory in Atlanta is one. They know how to deal with these patients. As a Hazmat tech, I can say that constant practice via drills is needed to perfect and maintain the skills required for safe use of personal protective equipment. A one hour lecture 6 months ago will not do it. where was the critical thinking? I know as a common x-carpenter where to buy a hazmat suits. How and why one would separate a contagious room from the rest of the hospital. Now I wouldn’t know if burning wastes would be a problem or not, but wait I know how to see how others have. Your telling me the hospital couldn’t fathom possibilities. That they need forms and mimeographs to act? heck a common foot solider in ww2 would have know better. The part I liked was that they apparently sent infected blood samples through the hospital’s pneumatic tube delivery system. What we’re seeing here is the same thing that you see at the beginning of a major war. The existing military and political structure is good at soldiering in peacetime but may not be up to the challenges of business not being as usual. It seems never to dawn on the top people at these agencies that all their organizations are ever really ready for is “business as usual”. Unless. They take action to discover where things really are. And yet they don’t. On Wednesday the World Health Organization warned of the threat of a global plague, which can cause “vomiting, marked hypocalcemia, metabolic acidosis, convulsions and, in rare cases, even death.” Ebola? No, the WHO culprit is the overconsumption of energy drinks. Good to see all those animal parts heading back to Africa. My understanding of a recent news broadcast is that there are four beds One of which at Atlanta is currently occupied by a Nurse. Well, I’ll believe they are free of it after 30 days of no new cases…. Hopeful, yes, but careful. Good catch… I forgot the medical grade incinerators…. and did I mention bleach by the barrel? I’ve cleaned that bit up a little. Basically nobody gets out until 30 days post recovery (if infected) or 30 days post exposure to anyone who was infected or any potentially infective materials. Just saw a nurse on the TV (from Dallas) saying that they were told to put on what amounts to regular ‘universal protection’ with double gloves and triple booties?… but the face shield left their lower front neck exposed and with air flow up toward nose, mouth, eyes. That whole “wet contact” protection that doesn’t work against damp aerosol particles… She claimed to have questioned leaving exposed skin at the time. Her tone of voice indicated she was truthful, if angry. The local hardware store has enough gear (including respirators) to make a decent cover. The local specialized sewer worker clothing store too… It’s just not hard to find. The problem wasn’t availability of goods. The problem was the hubris to think they KNEW that virus cold and that it was “wet contact ONLY.” Ignored the Peter Principle and Murphy’s Law. No?! Really? Then sent it through a pneumatic tube system? I know, not a big improvement. 24 countries in Africa have travel restrictions, which is the reason Ebola is mostly confined to just 3 countries, and not two dozen. In Senegal and Nigeria when it first appeared, they stamped it out pretty darn quick by not letting more infected people in, plus they traced all known and suspected contacts. Neighboring countries also have closed their borders months ago, and flight restrictions have been enforced months ago. Thankfully these sane and sensible leaders in Africa have not listen to the “experts”, or Western leaders, who see no value in travel restrictions. Those that say there shouldn’t be travel restrictions still apparently understand the importance of quarantine for people who might spread it. A contradiction surely. After a few days in the isolation ward, my condition became worse. My mother was also fighting for her life. She was in a terrible state. At that point, the nurses made the decision to move me to another tent. By then, I barely understood what was going on around me. I was unconscious. I was helpless. The nurses had to bathe me, change my clothes and feed me. I was vomiting constantly and I was very weak. My mother and father died while I was battling for my life. I didn’t know they were dead. It was only one week later, when I had started recovering, that the nurses told me that they had passed away. I was sad, but I had to accept that it had happened. I was shocked that I had lost both my parents. But God spared my life from the disease, as well as the lives of my sister, my niece and my fiancé. I am grateful to the workers here for their care. They are very nice people. They really care for their patients. The care, the medication and self-encouragement can help a patient to survive. When you’re sick with Ebola, you always have to encourage yourself: take your medication; drink enough fluids – whether it’s oral rehydration solution, or water or juices – but don’t keep your system empty. Even if they bring you food and you don’t have any appetite to eat, just eat the soup. After 18 days in the treatment centre, the nurses came in one morning and took my blood and carried it to the laboratory for testing. Later that evening, at around 5 pm, I saw them return. They came and announced to me that I was ready to go home because I had tested negative. I arrived back home feeling happy, but my neighbors were still afraid of me. Few of them welcomed me back; others are still afraid to be around me – they say that I still have Ebola. There was a particular group that kept calling our house ‘Ebola home’. But, to my surprise, I saw one of the ladies in the group come to my house to ask me to take her mother to the treatment centre because she was sick with Ebola. I did it, and I felt happy that at least she knows now that someone cannot go to a supermarket to buy Ebola. It’s a disease that anyone, any family, can get. If someone has Ebola, it isn’t good to stigmatise them, because you don’t know who is next in line to contract the virus. Now, I am back at the treatment centre, helping people who are suffering from the virus to recover. I am working as a mental health counsellor. I find pleasure in helping people, and that is what brought me here. My efforts here may help other people to survive. When I am on a shift, I counsel my patients; I talk to them and I encourage them. If a patient doesn’t want to eat, I encourage them to eat. If they are weak and are unable to bathe on their own, I help to bathe them. I help them with all my might because I understand the experience – I’ve been through the very same thing. My elder brother and my sister are happy for me to work here. They support me in this 100 percent. Even though our parents didn’t survive the virus, we can help other people to recover. Doctors Without Borders/Médecins Sans Frontières (MSF) has made the very difficult decision to temporarily suspend medical activities at its hospital near Bo, Sierra Leone, because of the strain of responding to the Ebola outbreak in the country, the organization said today. I agree with you in large part with some changes in certain areas. Don’t spread the problem and don’t burn up your people through sloppy containment procedures. There has recently been some new information coming out that even a 30 day quarantine may not be adequate. The 21 day incubation time is only a 95% probability reference. 98% is reached at 42 days. This decay time is a fat tail curve and has a very long tail. The current screening protocol also depends on the assumption that a patient with ebola will reliably present with a fever in the early stages of the disease before they become wildly infectious. This appears to be false. If this is an accurate assessment than fever screening is only a gross check. It takes over 48 hours and at least 2 tests to reliably determine if someone is Ebola positive so in those locations where folks are being turned loose after just a cursory examination and declared not and Ebola risk are likely to “leak” Ebola positive patients (like in Dallas on the first ER visit). There is also some evidence starting to appear that Ebola already is airborne capable under suitable conditions. Supposedly the virus can remain viable on a hard surface for up to 10 hours under proper conditions. The Reston variant has already displayed airborne transmission between groups of monkeys in separate rooms connected only by an air handling system. The bad news is that this epidemic is so slow moving that people who do not understand the brutal power of exponential growth will not take it seriously until it gets well developed. One study I saw estimated that the average time between reinfections from one patient to the next is 12 days, and the average number of reinfections is approximately 1.7. If you work those numbers as compound interest you see that the growth curve is just getting started. The latest numbers I have seen from the WHO sitreps look like the current reinfection rate is closer to 1.4 (assuming they have not missed too many cases that were never reported). I fear that this one is going to get out of hand if folks don’t have a big time revelation about what those exponential growth rate numbers mean. Air is not recirculated in a hospital, for reason you state. One of the reasons running them isn’t inexpensive. Thanks for that. I’ve never managed a hospital and had hoped they didn’t recirculate, but had not seen any evidence one way or the other, so assumed the worst. Nice to know that other folks thought about it too. And that money took second place. Thanks for the links. Nice, very nice. Yes, it’s that miss-match between the theory (one number, one size fits all) and nature ( constantly varying with probability distributions) that causes me to get heartburn at our approach. most labs which do anything with liquids or gases, not electronic labs, run totally on fresh air. The exhaust may be run through various degrees of filtration depending on what’s done in them. Frequently fume hoods are installed for experiments whose products should be contained. they are designed to take air from within the room and exhaust it up the stack. There are alternative fume hood designs which balance flow between room and fresh (outside) air to try to reduce conditioning requirement for incoming air. I suspect not much of this has changed since I did lab and hospital design in the ’70s. I worked on a particularly challenging project in the mid ’80s which required control of unusually hazardous substances under very challenging conditions and was associated with my visit to Aberdeen about the same time as your visit – i remember that we saw the same thing there. First rule of viral infections is: you always become infectious before you become symptomatic! What isn’t well known is what the minimal infectious dose is for each possible route of transmission. A/C? That reminds me of how Legionella got spread. People might want to set up positive pressure systems and put Millipore filters on the HVACs. Frieden is telling us that in the grand scheme of things the Flu is much more scary than Ebola. Remember that the Flu killed tens of millions of people circa 1918 while Ebola death tolls are mere thousands. How could somebody with that degree of cluelessness be entrusted with safeguarding the American people? Well in a purely mathematical sense he is correct but it is a bogus and false comparison. Sort of like comparing the life time destruction of Genghis Khan and his sons and the damage done by a 6 month old Hitler. Flu has been an endemic killer for perhaps a 1000 years and preys on the vulnerable (very young and elderly) most of all. The Spanish flu of 1918 was the exception to that in that it for some reason killed mostly the young fit adults, probably because the older generation had been exposed in their youth to a less lethal predecessor of similar genetic makeup and had some systemic immunity that helped them resist it. Ebola on the other hand could be like the black plague of the middle ages and systematically burn through the entire civilized world until there is an effective treatment. If it ever gets a good hold in a major population concentration it will completely saturate the ability to do the most effective counter measures like contact monitoring.The result would likely lead to large area quarantines of entire cities as the only preventive measure to allow effective control. If a terrorist network or just old fashioned bad luck and carelessness allows a large number of seed infections to be planted simultaneously in multiple locations it could easily swamp all the worlds medical resources and crush normal social and commercial connections which are vital for our current international economy to function. Exactly. And, IMHO, we’ve already reached that “major population” concentration point since it is in major cities in the African nations ( and their health care systems can’t cope). So we need to wall it off THERE, and then pour in as much support as can be delivered as fast as possible. Any added source points just exponentially makes the problem worse. We need to get the present areas into the “less than one to one” transmission regime while preventing any new locations and do it as rapidly as it can be done. The notion that an air travel ban will be a disaster is just bogus. It does NOT prevent ships delivering food, nor charters and military transports delivering medical staff and gear. Saying ‘nobody gets on’ does not prevent people and goods from getting off…. BTW, the reason the Spanish Flu killed the healthy was exactly because they were most healthy. It caused immune system cascades (cytokine storms? Something like that) and those with the most strong immune systems made the most ‘stuff’ that attacked their own cells and made them most sick. That is the nature of the H1N1 type. One of those (H or N) codes for transmission and the ‘1’ variant had very high transmission, while the other codes for how strongly it causes illness with the ‘1’ variant being the flag for the type that turns your immune system against yourself. Mostly we’ve had other flag types ( 2, 3, 5, etc) in one of the other markers (H N) since then, and each year the ‘mix’ in the vaccine is rotated a bit to try and match what they expect to see. When last H1N1 started circulating, I asked what was in the vaccine. It wasn’t H1N1, so I skipped it (having had most of the others…) Whenever they have an H1N1 vaccine and an H1N1 outbreak I’ll bother to get the shot… until then it doesn’t matter to me. 1) We KNOW how the virus spreads and you can not get it without direct wet contact (that you do not get in travel). 2) You are NOT infectious until you have symptoms including a fever, so no risk of getting it from a sick person who isn’t sick yet. 3) Someone who is really sick isn’t going to travel. 4) We are checking temperatures, and that’s enough. Every single one of those is not true… There are edge cases for all of them that are exceptions. 5) It would be inconvenient to us medicos who want to travel freely in and out and move equipment. 6) It would hurt the economies of those nations and we don’t like that. The whole argument is bogus. THE best thing to do is wall it off and pour in all the support possible to stop spreading it and eradicate the disease as rapidly as possible. The only time I have been sick in the last five years followed immediately after travelling by air. Beside the possibility of spreading contagion to fellow passengers, air travel is the ideal means to spread disease carriers far and wide. What better illustratration of this than the case of Mr. Duncan who has already managed to infect at least two people in the USA. My sister traveled on the Mooltan with smallpox patients on board. Back then everyone unterstood the need for isolation. Action by the British government action was swift and effective. Back then we had realists in charge instead of academics. There was a very good reason that Ellis Island included manditory medical screening and quarantine periods before suspicious populations were turned loose to run through the crowded city centers. They learned the hard way with Typhus and other communicable diseases but today’s medical establishment has grown arrogant and complacent that they can handle any problem with modern medicine. Exponential growth is your friend if you have a big bank balance earning interest but it is most definitely your worst enemy if you get behind the growth curve. Exponential growth curves for diseases always follow a logistic curve. There are only 3 possible outcomes. Growth continues until the entire population is infected (new disease to a population — see small pox in the Americas). If it is highly lethal you can wipe out entire population groups. Growth continues until it has infected all susceptible persons (old disease and or some random resistance in the population) If it is highly lethal you wipe out all the highly susceptible members of the group and then the disease dies out until a new generation of susceptible persons is born, then it makes another pass. (see black plague in Europe which made multiple passes through cities and countries over more than a century). Someone in charge needs to read about Typhoid Mary and the story of typhus. they seem pretty adamant about the wet transfer. clearly you think there are other modes. would they be included in “wet transfer”? Or are you suggesting that they are implying that sneezes are not wet transfer. or something else? As I understand it, the official dividing line between airborne and not airborne is at 3 ft distance, inside that distance, the primary hazard is direct wet transfer by droplet spray from sneezing talking splashes etc.. Beyond that, technically to form an airborne biohazard it must be able to form biologically active and viable fomites. A fomite this is a microscopic bit of material that is formed when a small droplet evaporates down to its payload of mucous and the virus it contained. It is so small that gravity is trivial compared to Brownian motion and turbulence in the air. Can that dried droplet core and its captive virus remain viable and biologically active long enough to be swept by wind or air currents to a favorable surface for it to be wetted and release the viral payload? Such as the eye surface, nasal passages mouth or hand/mouth transfer. I have seen two different references that mention that the Ebola virus can remain viable on a hard surface for 6 – 10 hours under favorable conditions. If that is true, I see no reason to believe that a microscopic bit of dried mucous cannot be infectious for 6-10 hours. Ebola also is highly infective (ie it only takes 1 – 10 virus particles to trigger an infection in a new host) — At least that is “my under standing”. One reference mentioned that in tropical Africa with high humidity, small droplets would fall to the ground before they evaporated enough to be wafted on the breeze. But like influenza in cool dry indoor air in the temperate zone in the winter time, the very smallest droplets would evaporate to their payload core before they could settle out and then airborne transmission is most effective. This makes sense to me and until some one addresses this path specifically and gives a reason why it would not work, cautious response good practice in any hazmat or biohazard situation says that if it “can” it probably “will” sooner or later. This view is also supported by the documented airborne transfer of the Reston variety of Ebola between rooms in a lab via the air ducting. If Reston Ebola can do that, the presumption has to be that Ebola (Zaire) can also until proven otherwise by experimental tests. While this may be OT it is one of the arguments arrayed against nuclear power plants. The answer is to build small NPPs that operate at one bar pressure with reactor vessels entirely below ground level. Thank you Larry Ledwick for this pretty convincing look at the possibilities. Larry pretty much summed it up. Dry surfaces and a history of ‘anomalous’ transfers. Nature is a bell curve not a bright line…..
One of the things people fail to understand is that all characteristics which favor infection should over time be selected for as the most infective variants will in time dominate the population of victims. Likewise any characteristic which increases the number of subsequent infections such as the reinfection rate should also be selected for, as those who infect the most susceptible people will be more likely to pass on their variant of the virus. This leads to things like being infective before debilitating symptoms cause self quarantine of the victim. Those who can still walk around with mild symptoms would be more likely to infect others compared to someone who gets suddenly slammed with debilitating symptoms. One of the characteristics of RNA viruses is that they are “sloppy” at replication so they mutate at a higher rate than other infectious agents. Compound that with huge numbers of victims incubating their own variant of the virus and the most infectious will pass on the disease in preference to those which have characteristics which tend to reduce infect-ability. I’ll be considerably encouraged if this thing doesn’t spread within the US outside the community of folks trying to deal with the infected directly. Which isn’t to say that there’s not plenty to worry about in the incubators of West Africa. It could be that we’ve only gotten a hint of things to come with more effective infectors evolving in the what’s going on over there – particularly in the area of undetectable virulence. That, and the potential for a native reservoir formation in our animals, are the things that worry me most. Why hubis is so bad in the context of Ebola. Insanity or evil. It is insanity only if we are correct when we assume that our authorities actually wish to protect us from disease. If a pandemic could somehow produce more power or more profit for The Powers That Be, would you trust them with your life? There is an interesting piece of research showing how Ebola invades the body by misdirection and camoflage to the bodies immune sysem. the fact that the disease can survive within a carcass/cut meat and maybe sloppy cooking,= makes me wonder how this thing is as small as it is. There must be another facet. Most of the time Ebola stays small as the tiny village it infected all either died, or recovered, before it spread outside of that group. Yes, “bush meat” is usually the first step into people. But not just any bush meat. The wild reservoir is not known. (Part of why I fret about it becoming endemic in our wild animals. They think it might be fruit bats. Will any bat doo? Or how about the close relative “rat”…. or squirrels or whatever? We know it infects dogs (canids) but they don’t get sick, just recover (while spreading). What about from domestic dogs to, say, N. American Fox? OK, back at bushmeat: The thought is that an occasional monkey gets it from bats / bat droppings. Then the occasional hunter gets THAT monkey. Then a village dies…. What’s different this time is that the ‘burn out’ isn’t happening. Ebola has made it into a major metropolitan area (several of them). Without extraordinary effort, it will end when ALL the communicating (physical contact communication) cities have massive die off. That is what we are working to prevent. Now it’s not in ALL the bushmeat, or even most of it. Or even a lot of it. So other than the original jump, that path doesn’t matter. It’s the human to human ‘wet contact’ (that includes ‘droplets’ from sneezes and coughs…. and dry on surfaces for an hour or 5) that is activer here and now. And THAT transmission is still showing a simple exponential growth. Until that changes, it isn’t a surprise at how “small it is”; just a matter of the math. Doubling time of 21 days “takes a while” to do 30 doubles. That time is 630 days. At 1/2 year (or about 546 days) you have 33 Million involved. But just 84 days later (smidge under 3 months) it is 536 Million. And 63 days later it is 4.2 Billion. About there the rate stops being exponential as you are running out of people to reliably infect. BUT, it’s about 21 days to ‘everyone on Earth’ involved one way or another. Being off 10 days one way or the other doesn’t matter much. Now, we’re back at about 10,000 to 20,000 people globally. That’s between 294 and 315 days. Pretty much right on track. It’s been about a year since the initial case.but exactly how long I don’t know. Recent doublings have been about 21 days. It might have gone at a different rate early on. That’s the problem of an exponential growth from a low value. Initially it LOOKS weak and slow. But you really do not want to get past the 1/4 point…. which we are now. From here it massively accelerates, or Africa finds a way to drop contagion below 1:1 and soon. does an in depth look at using hamsters as an Ebola model. It has an intro on using mice and lists the ways they are not so well suited. What particularly gets me is that the mice DO get Ebola, but are not as prone to having all the symptoms we have. Bad as a ‘disease model’ for human disease; but good for the virus. What this says to me is that it is quite possible for Ebola to migrate into several different rodent species, live there reasonably well, and be spread all over the place. So first ‘bum who dies in an alley’ and gets nibbled by rats, we can have Ebola endemic in the sewers of NYC (or anywhere…). Less clear is how well rodent immunity would clear the virus. Do they become persistent carriers, or only ‘sick for a while then recover’? Permenant problem, or alternating flushes of outbreak? Bottom line of it, for me, is that my worry about the virus ‘making a leap’ to an alternate host in North America is not all that big a leap. More like a short stroll…. “In infectious disease, it’s always a numbers game. It’s just about numbers. It’s statistics. It’s cold-blooded numbers. The Ebola virus has no standards other than trying to find susceptible hosts. So letting people in from the outside is a form of roulette,” he told CNSNews.com. I agree entirely — it is simply a brutal unemotional numbers game. Exponential growth is an unforgiving enemy. A game you cannot afford to lose or place second in. You get ahead of the numbers curve or you pay a fearful price if the random luck of the draw means the disease gets into your community and catches you on the wrong foot. It appears that J&J expects to have 250,000 doses of a vaccine ready for test use by heath workers in about 6 months.Testing to start in January, up to a million doses by end of 2015. This is a mix of J&J and a Bavarian developed vaccine. Don’t know about the Chinese vaccine. Both to be tested in Africa as soon as possible. There seems to be a great deal of push back by locals against western medical treatments to curb Ebola so there will be no problem finding untreated exposure to compare to treated people. Well they are gradually and reluctantly being drug kicking and screaming into reasonable precautions. They have clamped down on points of arrival limiting passengers from those countries with rampant ebola outbreaks to 5 airport arrival points, and today they announced that they will enforce a 21 day monitoring period for all new arrivals from those countries. These actions should have been taken about 24 hours after the story of the Dallas patient came to light. Simple low impact restrictions that at least have a chance of limiting damage if someone does come into the country without apparent symptoms. It also came to light today that there is already on the books legislation that allows the president to place emergency restrictions on immigrants as needed for exactly this situation. If someone has the means to plot this on a log log plot it would be appreciated. I did a crude plot by hand and using the day number on the x axis and the fatalities on the y axis you end up with an exponential plot (straight line on log log) that goes up at about 20 degrees from the vertical which shows a slight break in the last few weeks. That indicates that they are making a slight dent in the re-infection rate or average number of re-infectons per victem. Current doubling rate appears to be between 36 and 44 days according to my crude plot. Perhaps someone who has more current math skills and computer plotting tools can tease out the growth exponent. As I recall the absolute slope of the log log plot is the exponent but it has been a very long time since I did any of this sort of graphical analysis and can’t find my old text book for a refresher. format got screwed but it is date, week, day number, cases and fatalities by column. Thanks for the fix in format ! I thought the last column got lost until I scrolled down enough to see the slider at the bottom of the fixed width window. Larry; thanks for the data. Fatalaties are lower on day 255 than for day 251? Yes there is some inconsistency in the numbers from sitrep to sitrep, I assume that deaths originally attributed to Ebola got changed to another cause of death like starvation or something else after the numbers were reported to WHO. I used the summary numbers in the first page of the sitrep documents (Overview section) but they keep changing the format of the sitreps so the later ones have slightly different layouts than earlier reports. Years ago I worked in civil defense and we plotted radiation decay for exercises using log log paper, and plotting the radiation readings, then you could calculate the decay exponent by calculating the slope of the plot in uniform units for the two legs of the slope triangle. I tried it early this morning but did not have time to figure out how to print a usable log log plot do the plot on and measure the rise and run of the slope triangle or refresh my memory on how to calculate the exponent directly from the values in the table. I did a little number crunching and it appears that the 14 day exponent of growth is in the range from 1.0282 — 1.0534 . Obviously it will change as conditions on the ground change regarding treatment protocols, and manpower/resources. But that appears to be a good estimate of the growth rate exponent over a 14 day compounding interval under recent conditions. The reduction in the exponent since day 237 implies that corrective efforts are probably starting to slow the growth rate slightly, but until that exponent gets reliably below 1 the death toll will continue to grow.